Objects that we create seem to have some of our own inner magic infused. I wish you could see this flower still life in person because you can feel how magical it is with 15 flowers made by the cutest preschoolers in Aurora, Illinois (and 2 by their teachers). Here is one of them: It was so much fun talking to the kids about art and the shapes they saw in the flowers. They cut out shapes and used some of the shapes I provided too. Then, used gloss medium with paintbrushes to create their flowers with minimal direction. When I first took the flowers to my studio after working with the kids in their classroom, I was a little nervous about how I was going to make the collage look like a cohesive design. All the flowers looked so different, and some were so abstract it was hard to make out a flower shape, which I loved about them, but also felt challenged. Something else that I love about the flowers is that they are unpredictable, beautifully textured and layered. I didn’t want to add too much to the kids’ flowers for a few reasons. 1.) I wanted them to recognize their flower art and be proud of it. 2.) I feel like changing someone’s art may make them feel as if their art/they aren’t good enough. In the end, I did add to a few of them for design and composition purposes to make a more cohesive piece that may draw more money for the auction. They are all so beautiful! 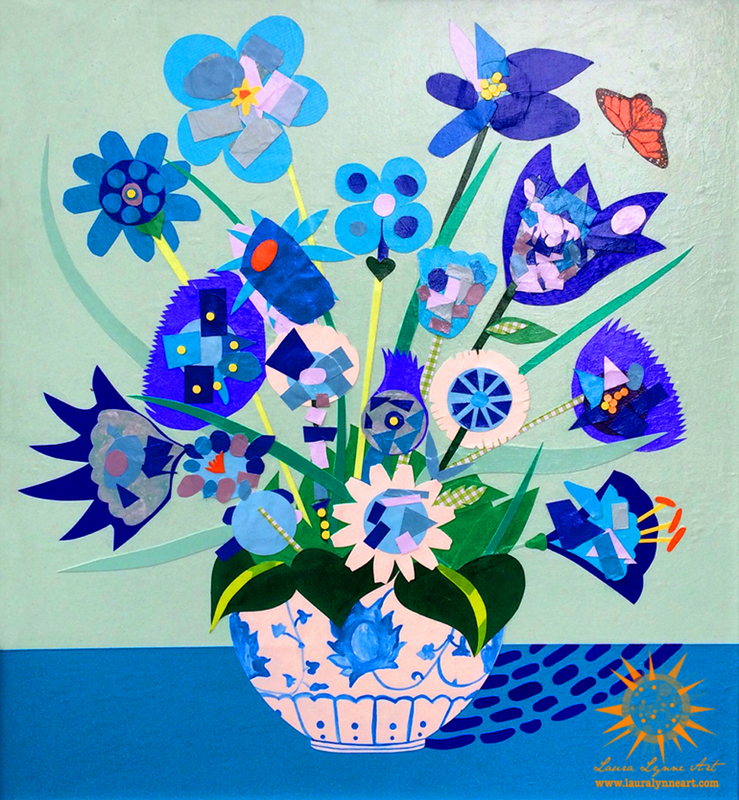 If you are interested in a flower collage workshop for kids or adults, please contact me. See more of my work here.